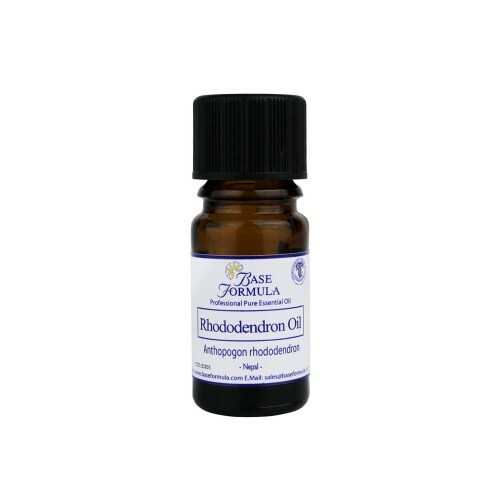 Rhododendron (anthopogon) essential oil spiritually calming & grounding. Rhododendron has an exotic, earthy, balsamic aroma. Traditionally used in Tibetan Medicine. Known for its balancing, clarifying, invigorating effect on the mind and body. Rhododendron essential oil has an exotic, earthy, balsamic, slightly floral aroma. It is steam distilled from the leaves and flowers of the Rhododendron anthopogon which is native to the Himalayas. There are over 850 different types of Rhododendron that grow all over the world but anthopogon is the only one that is distilled for its oil (it is not the same as the common Rhododendron that we see growing in the wild and in our gardens here at home). Rhododendron (traditionally known as balu ot sunpati) has been long been used in Himalayan sacred rituals and in Sowa Rigpa (Tibetan Medicine). It is one of five common Himalayan incense herbs symbolizing the elements that are offered to sanctify and pacify the environment and Himalayan healers have traditionally made the leaves and fresh flowers into a therapeutic herbal tea to aid digestion, stimulate the appetite, ease sore throats and to relieve liver disorders. In modern day aromatherapy the oil is known for its balancing, clarifying, invigorating effect on the mind and body. It has antibacterial, anti-inflammatory, anti-spasmodic and decongestant properties and is also believed to support the nervous system and liver. Avoid in pregnancy and do not use on babies or small children. Rhododendron essential oil has a mild topical anti-inflammatory and antibacterial effect which can be beneficial for inflamed, troubled skin. It can also be added to shampoo for healthy, shiny hair. Rhododendron can have a tonic effect on the nervous system and can help to quieten an overactive mind. It is spiritually calming and grounding and is often used to support meditation. In Himalayan aromatherapy its balancing properties help to promote inner unity. Rhodoendron essential oil is an effective decongestant and antispasmodic for the respiratory system. It is also believed to help support the liver and stimulate the kidneys. The oil can be used topically to help reduce inflammation in the joints and muscles and to assist with rheumatic conditions including gout. Lavender, Orange Sweet, Geranium, and coniferous essential oils such as Cedarwood or Pine.